Greg Doran’s Richard II takes a complex Shakespearean political conundrum, strips it down to the Bard’s beautiful verse, assembles a platinum cast and presents the tale in a form that is accessible, exciting and at times deeply moving. David Tennant is Richard, thoroughly earning the star-billing of the title role and his name alone will ensure that the production sells out at the Barbican. (It is already sold out at Stratford.) The marketing impact of “brand Tennant” powerful though it is, almost unfairly masks the underlying genius of this production, as Tennant and his supporting company are simply outstanding. The play opens to a beautiful projection of Westminster Hall where we find Jane Lapotaire, Gloucester’s widow, mourning at her husband’s casket. It’s a tiny role, sweetly executed by this national treasure of an actress (why has she not yet been honoured?) and sets the tone for the themes of vengeance, retribution and restitution that are to run through the piece. Michael Pennington plays her brother in law John O Gaunt wise and politically astute enough to have suspected the King’s complicity in Gloucester’s death. Every word that Pennington speaks is measured and weighted to perfection and when later in the play we meet Oliver Ford Davies’ York, there can surely be no finer collection of senior UK Shakespearean talent currently assembled on one stage. Making his RSC debut Nigel Lindsay, some months since he washed off the green make-up of Dreamwork’s ogre Shrek, steps up to the role of Gaunt’s son Bolingbroke. Banished by Richard he returns from exile, raises an army and challenges the monarch. Lindsay gives a fine turn combining a complex mix of ruthless vengeance with compassion. His character has more decency than most in this bloody tale and he gets the balance between good and bad spot on. Tennant’s Richard is sublime. Successor to Edward III, Tennant subtly yet brilliantly shows how he has become absolutely corrupted by absolute power. His and his fellow actors' interpretation of the text makes the complex poetry of the play immediately understandable, even to a newcomer to the story. When Bolingbroke forces the king to abdicate, Tennant’s aura of profound devastation and humbling bears an uncanny resemblance to that of the late Margaret Thatcher as she left 10 Downing Street for good and in tears. And whilst Thatcher (arguably) was not akin to the heartless monarch of 1399, that sense of "shock and awe" experienced when one sees before ones very eyes, the moment of a great person toppling, is easy to recognise but very hard to define. 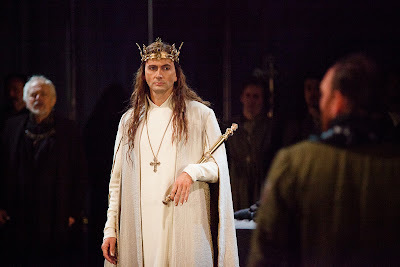 Tennant conveys such a moment in Richard II with ease and maturity, eliciting our sympathy in a truly moving portrayal. Richard II represents the RSC at its very best. Live musical accompaniment enhanced by three heavenly soprano voices (who provide a beautiful mise en scene before the lights go down, as a backdrop to the grieving Lapotaire) only adds to the quality on offer. Unmissable. The production will be broadcast live from Stratford, to cinemas across the UK on 13th November 2013. To find out details of these screenings, click here.